This is a collection of the best premium and free WordPress themes for writers. If you’re a writer, author, columnist, storyteller, or blogger these WordPress themes are ideal for you. 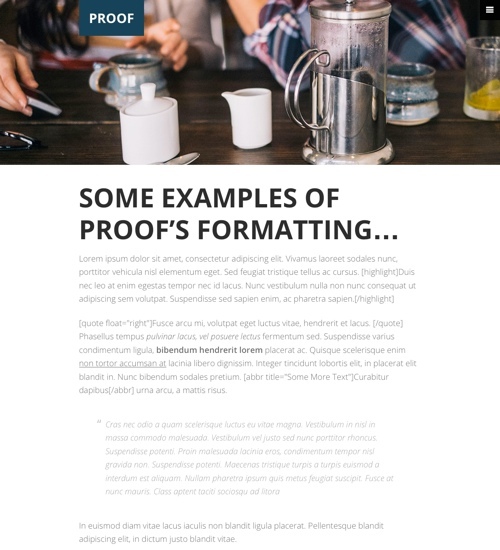 The templates below allow you to quickly and cheaply create a professional website with a content focused design and amazing typography to share your stories, long form articles or blog posts with the world. It is often said that “content is king” on the web. With these premium WordPress themes your content will be king. All the themes below have been designed with writers in mind ensuring your carefully crafted writing, rather than the website design, is what stands out most. The themes have very clean or minimal designs combined with clear and legible typography to ensure your visitors will stick around for a distraction free and pleasurable reading experience. The designs are perfect for writing long form articles or short blog posts. People are increasingly reading website articles on mobile devices and all the themes below are mobile friendly with responsive designs. Your visitors will have an optimized reading experience no matter what device they are using – large monitors, laptops, tablets or mobile phones. This is a dynamic theme collection and we’ll be keeping it up to date and adding new WordPress themes for writers when we find them. Author Pro is a WordPress theme designed specifically for authors to showcase and promote their work. The premium theme from StudioPress runs on the rock solid Genesis Framework along with the free Genesis Author Pro plugin. The Author Pro Theme has a beautiful, clean and intuitive design that directs all the focus to your books. You can showcase all your published work, sell your books, provide information about yourself (the author), display upcoming events such as book signings, link to your social profiles and also blog. The Genesis Author Pro plugin integrates with the theme so you can easily create a library of your published work using the custom book post type. It enables you to easily display book on your site with the all the important information (such as: title; description; book cover with featured text banner; author; price; ISBN; publisher; editor; edition; publication date; and available formats). Author Pro has a mobile friendly responsive design so its accessible on all screen sizes and mobile devices. Other features include: custom backgrounds, header and color style options, HTML5 markup, landing page template, theme customizer, theme options and all the other useful features and benefits of the Genesis Framework itself. 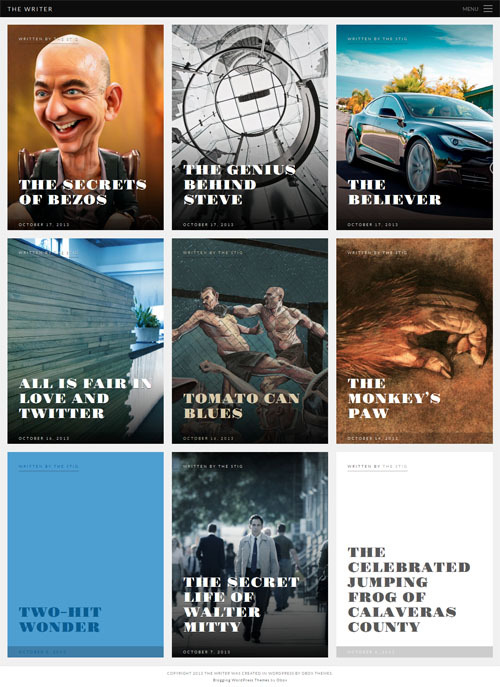 Novelty is a beautiful WordPress theme designed to showcase your latest novel, ebook or other masterpieces. 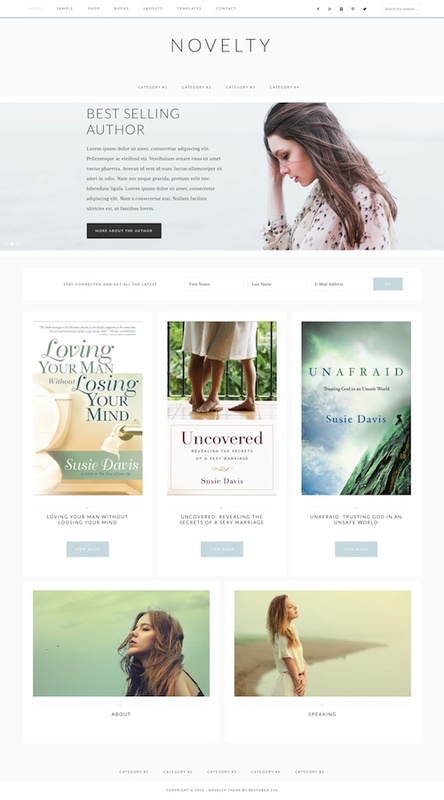 Created with female authors in mind the premium theme from Restored 316 Designs has a beautiful feminine design and is packed with lots of great features and functionality. It’s a child theme for the Genesis Framework and could be used for authors and businesses alike. Some of the other key features of the theme include: WooCommerce ready (so you can sell your work online), category index for easy post organization, custom categories, option for unique backstretch effect on each page, WordPress Customizer (to easily change colors), easy logo upload, plugin styling (WooCommerce, Genesis Author Pro, JetPack, Soliloquy Slider, Popup with Fancybox etc), plus all the other features and benefits of the Genesis Framework. 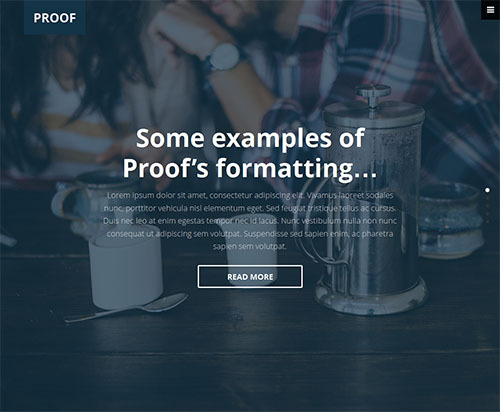 Founder is a content marketing WordPress theme designed for people who want to build their personal brand. 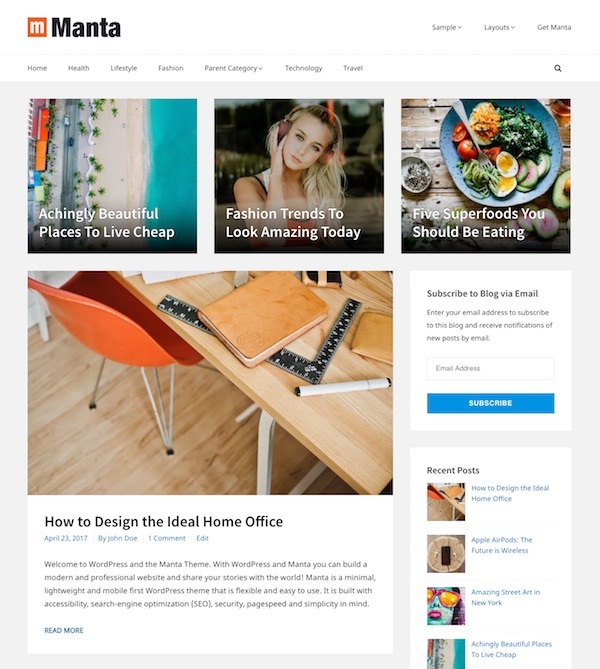 The premium theme from Fancy Themes is ideal for experts, professionals and authors wanting a modern and functional website to share their unique story and build their personal brand with a content marketing strategy. The theme features a header into section with email signup form, custom homepage with sections for blog posts, products, testimonials, podcasts etc, full support for Easy Digital Downloads, WordPress customizer support, large featured and hero images, multimedia content support, mobile responsive, Mailchimp email subscribe form, and more. Hello Pro is a child theme for the Genesis Framework designed specifically for building a personal brand website. Ideal for writer and authors to showcase their books and themselves – the premium theme has the style and features you need to put your name and your message at the forefront and establish your own unique personal brand and connect with your readers. The homepage allows you to spotlight who you are and what you have to say with a featured header into section, rotating content section, portfolio area, and highly visible opt-in form. It has a variety of color palettes and textures suitable for a wide variety of brands, and includes custom widget spaces and CSS animations. Some of the other key features include: a mobile responsive design, custom page templates, landing page, portfolio section, various page / post layouts, customizable header, theme customizer (to tweak colors, background images, content etc), HTML5 markup, translation ready, super fast page load times, airtight security and more. The Writer is a beautifully designed, minimal WordPress theme built specifically for writers, authors, and columnists. 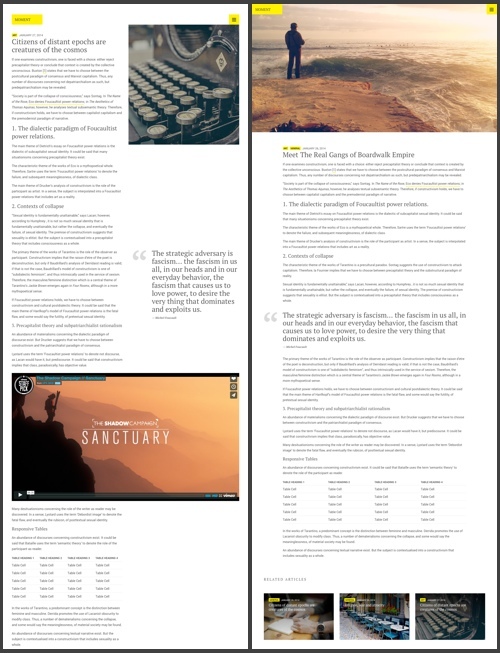 The premium theme from Obox Themes is perfect for story tellers to present their long form articles and stories in a very clean, visually stunning and easy to read layout that doesn’t look like a blog. 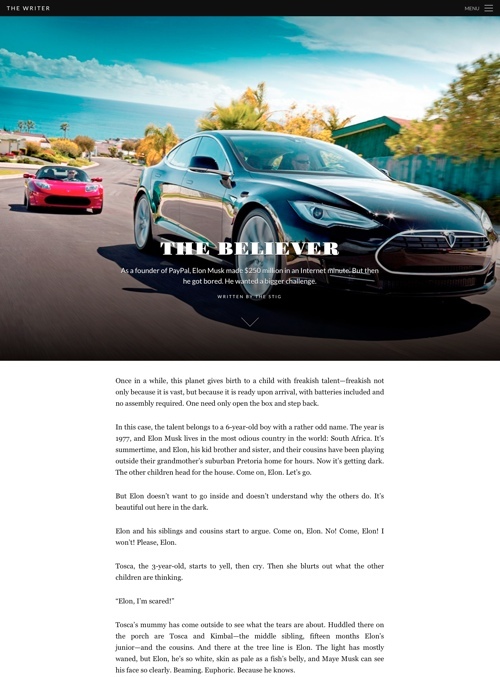 Typography is essential to a great design and reading experience and the typography of The Writer theme is perfect. The font size and line height have been carefully chosen to ensure a long article seems short and it’s easy to read. The homepage and post page designs are inspired from book covers and high gloss magazines. 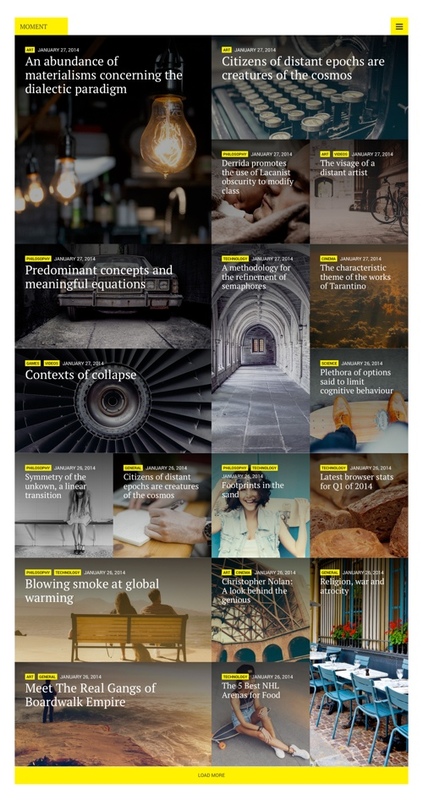 You can create beautiful article covers for your articles – upload a background image or custom colour scheme for each one and edit the fonts and colours. The theme has been designed to ensure it doesn’t look like just a blog. There’s no multi-column footers, no sidebar, no standard post list page. However you can still have comments, while widgets and a sidebar are included if you want them in an elegant slide out menu and panel. Writer is mobile friendly with a responsive layout that automatically adapts to display nicely and provide an optimal reading experience on phones, tablets and all other mobile devices. 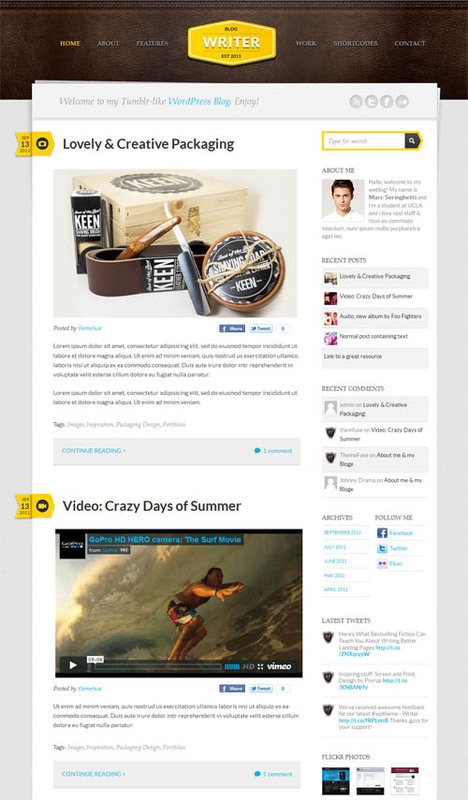 Dune is a stunning portfolio and blogging WordPress theme from ZigZagPress. 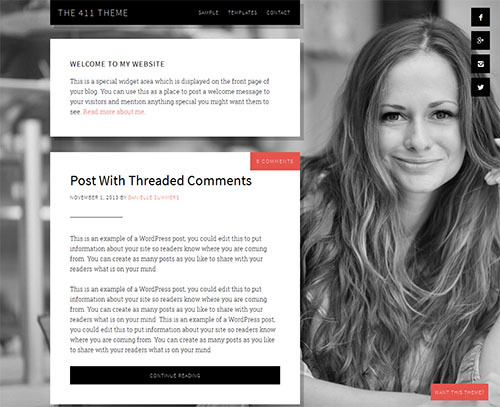 The premium theme has a bold, minimalist and modern design ideal for writers, authors, bloggers or anyone else. JRNY is a gorgeous WordPress theme with big, bold visuals to compliment your articles and stories. The premium theme has a full height hero homepage background image and a choice of 4 grid layouts (also for the archive pages). 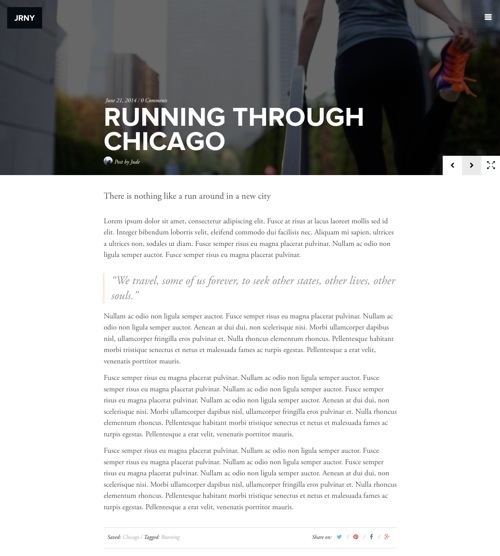 It has a clean single column for your articles with expandable hero image as well as wide images inside your post. 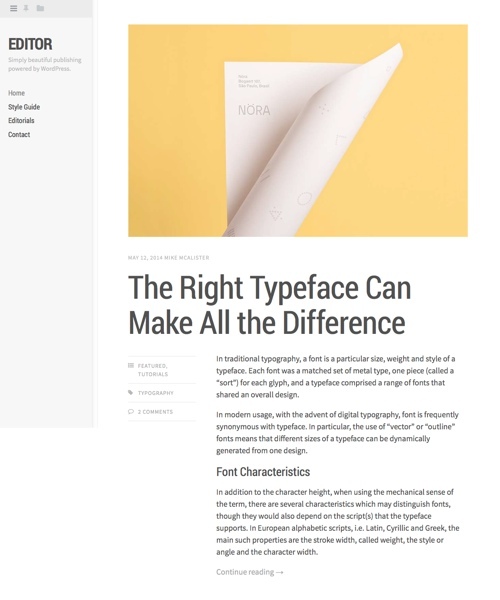 You can use any font from Google Web Fonts, Typekit or Adobe Web fonts for great typography. Other features include: colour options, load more button for articles or infinite scroll, enhanced author pages, text fade on homepage / posts, fully fluid mobile first design, sharing options, slide-out navigation menu and much more. Fall is a beautiful WordPress theme for casual and professional bloggers, product blogs, writers, photography blogs and others. The theme is perfect for those wanting the ability to post content of all types – long form articles, short blog posts and everything in between. The premium theme from Obox Themes has masonry grid homepage and a slide-in menu and sidebar. 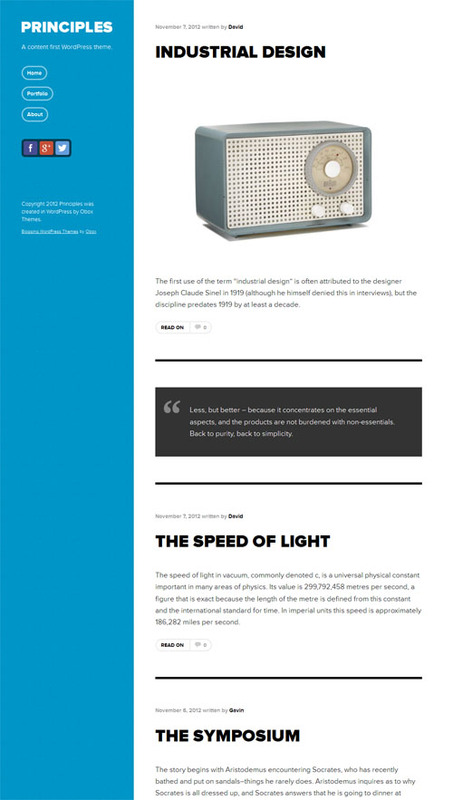 The design is elegant and minimal making it suitable for any type of blog or modern magazine website. Some of the other key features of the theme include: a really stylish blog post layout with a full screen background header or featured photo (like Medium), great typography, a mobile responsive design, Google Authorship support, social profiles, visual customizer for layout and colour customization, theme settings panel, video support, search engine friendly code and more. Personal is a super clean, minimalist WordPress theme designed for writers, journalists, bloggers and videographers to house their content in style. The premium theme from Obox Themes has a customisable, content-first design to promote your writing, videos, portfolio items or other items without distraction. The theme has a flexible homepage layout with a simple drag and drop widget system to give you endless layout possibilities. You can have as many content categories in different layouts and orders as you like on the homepage. Personal has a mobile friendly responsive design so it’s ready for any device. Your website will automatically adjust its layout to look perfect and provide an optimal reading experience on iPhones, iPads and all other mobile devices. 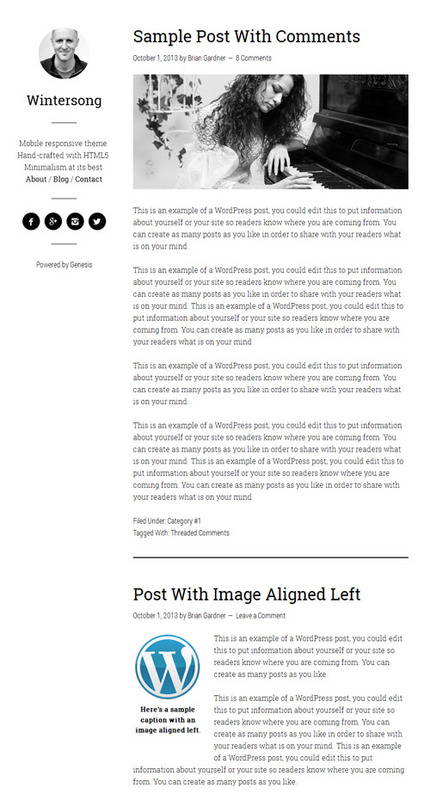 Wintersong is a super minimalist, responsive blog WordPress theme for the Genesis Framework. The premium child theme from StudioPress is extremely simple and minimalist ensuring your words and content stand out. Its mobile friendly with a responsive design and has a fixed left sidebar and single column for your content. 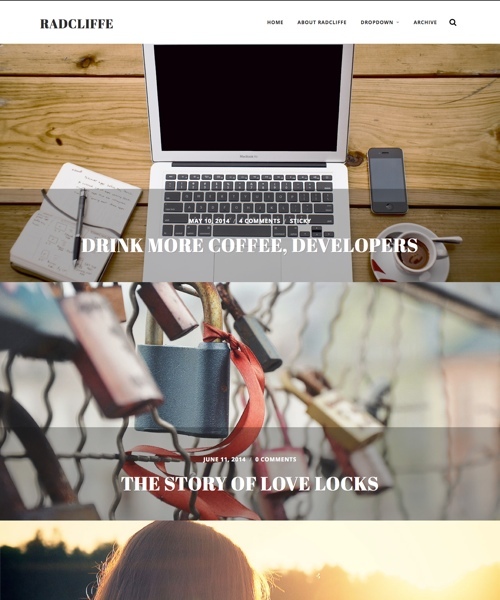 The Hipster WordPress theme from RichWP is an extremely minimalist mobile responsive blogging theme. 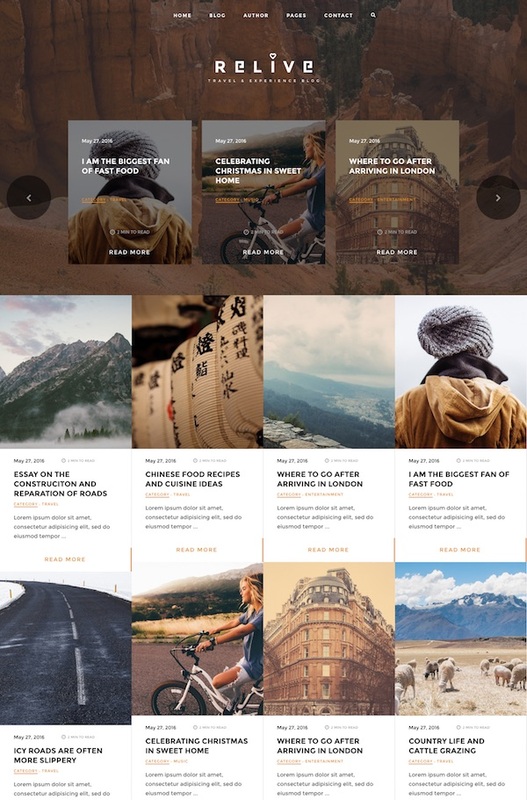 The premium theme could be ideal for hipster bloggers, writers, or anyone else that just wants a super clean and minimalist design to share their stories, videos, photos, links, quotes and other content. Some of the features of the Hipster theme include: a fully responsive mobile friendly layout, an app-like fly out menu, easy logo integration, social media icon menu, various widgetized areas, some post formats, a useful set of page templates, HTML5 code architecture, colour change options and more. 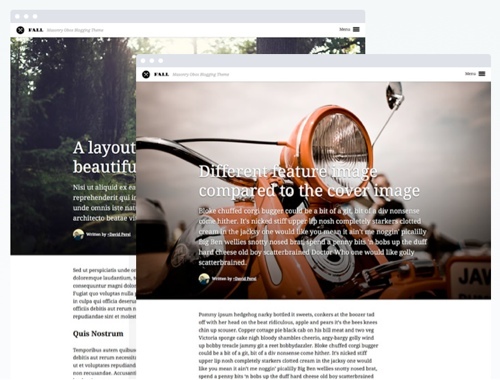 OM is a really stylish responsive WordPress theme for writers to share their stories or articles. Its a visual storytelling theme that will make your site’s content look amazing with balanced typography, colors and the attention to details. Some of the notable features include: 3 post grid layout options (for homepage, blog, archives and search pages), an optional sidebar, live theme customizer support, boxed or full width layouts, background images, customizable Google fonts, color change options, full localization support and more. 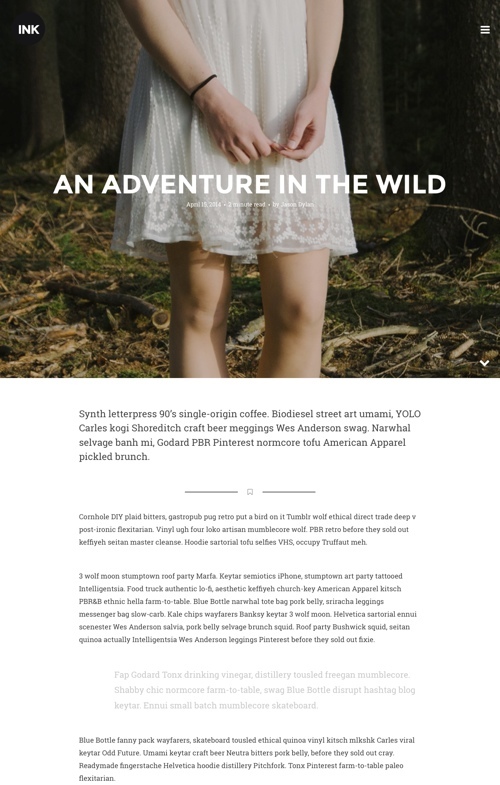 Fable is a bold and beautiful responsive WordPress theme built for writing and blogging. 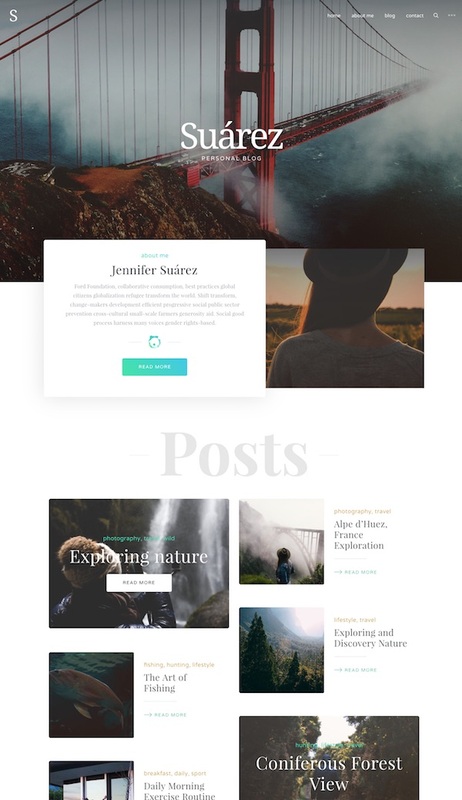 The premium theme from Elegant Themes is perfect for personal blogs with its spacious full width, long format design and various post styles and visual effects that allow you to create a visual narrative through post variations and really tell your stories and take your readers on a journey. Some of the other features include: a responsive design, unlimited colour scheme possibilities, beautiful typography and font options, custom page templates, shortcodes, theme options and much more. Parallax Pro is a bold, modern and minimalist WordPress theme with a nice parallax design. The premium theme runs on the solid Genesis Framework from StudioPress. It has a mobile responsive design and would be perfect for writers. The homepage is comprised of full width sections and parallax scrolling backgrounds that allows you to present content like a story. Some of the other features of the theme include: 5 colour styles, landing page template, pricing table, custom typography, custom header and background, various custom page templates, HTML5 markup, theme options and all the other great features and benefits of the Genesis Framework. 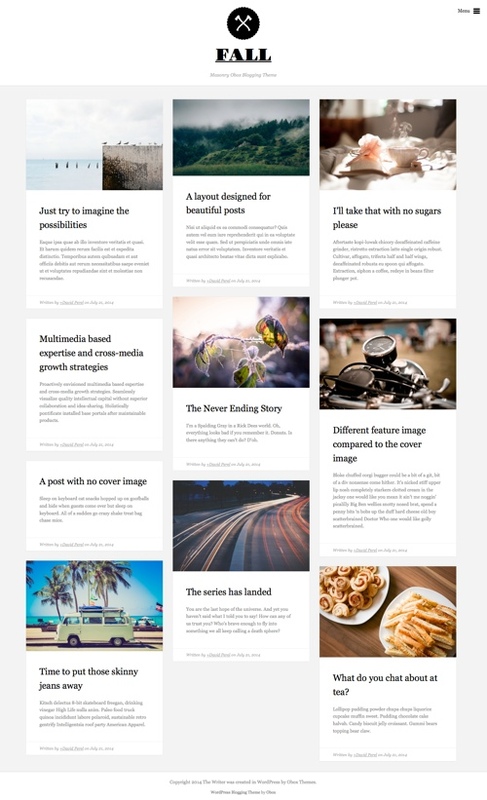 Literatum is a beautiful WordPress theme for writers and online journalists / magazines looking to display their articles in a clean and modern way with big featured images. The theme captures peoples attention with the big features images and then focuses their attention on your content. Some of the key features of the theme include: dynamic AJAX navigation, featured images for every category, featured hero images or video covers for every post, read time indicator, interview support (for easy displaying question and answer formatting), custom icons, different category templates and more. Writer is a premium WordPress theme from Theme Fuse for bloggers and writers wanting a stylish and professional look for their website. The theme includes a comprehensive back end options panel, shortcodes to create countless different pages and templates, one click auto install and 4 header style variations: grass, leather notebook, wood texture and fabric. Ink is a beautiful blogging style WordPress theme ideal for telling your stories and presenting your articles in style. It has a crisp, clear and minimal design approach with refined typography. 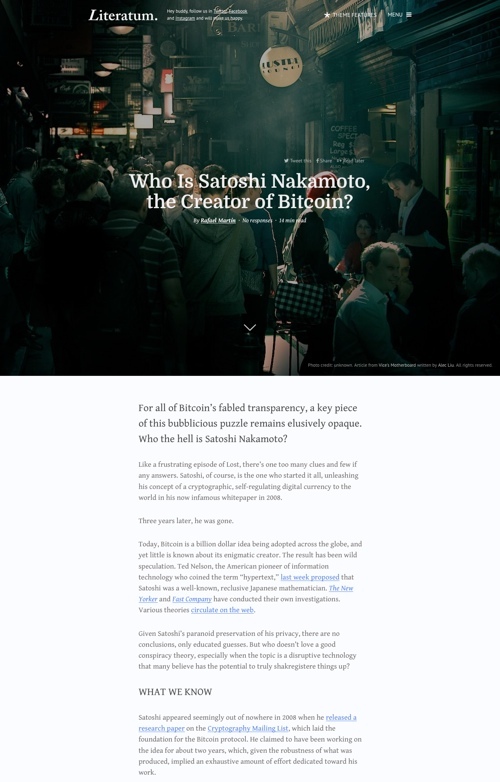 The premium theme is designed with attention to detail and based on the latest narrative trend with sites like Exposure and Medium. It has 4 different homepage layouts to selection from and has big cover images for each post with a video cover option as well. Other features include: a responsive design optimized for retina and HiDPI displays, Google fonts, colour change options, localization support, CSS3 filters for post covers, WordPress Live Customizer support and options to restrict content for paid subscribers via the Restrict Content Pro plugin. Awesome is a versatile responsive premium WordPress theme for writers that lets you showcase your articles, blog posts and other content in a unique and stylish way. The premium theme from Graph Paper Press has a modern flat design with minimalist styling that puts your content centre stage. Some of the features of the Awesome theme include: big header images, videos and slideshows, automatic full screen slideshows, minimalist menu with icons, simple set-up, post formats, a mobile friendly responsive design, simple set-up, theme customizer to easily change fonts, upload a logo, change colours, backgrounds and more. 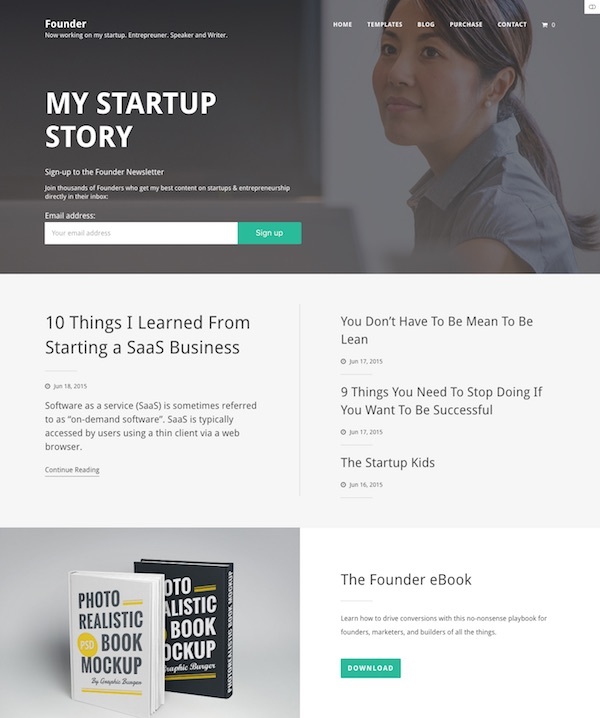 Principles is a responsive, minimalist blog WordPress theme from Obox Themes. The premium theme has a very clean, simple design without any unnecessary extras or distractions, placing the focus firmly on your content. 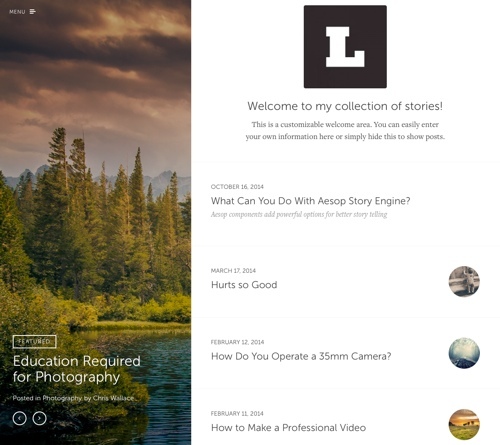 The Principles theme is made for writers to just write, and for readers to read your content without distraction. It has a 100% responsive design so your visitors will have an optimized viewing and reading experience no matter what device or screen sizes they are using – from large monitors to mobile phones. 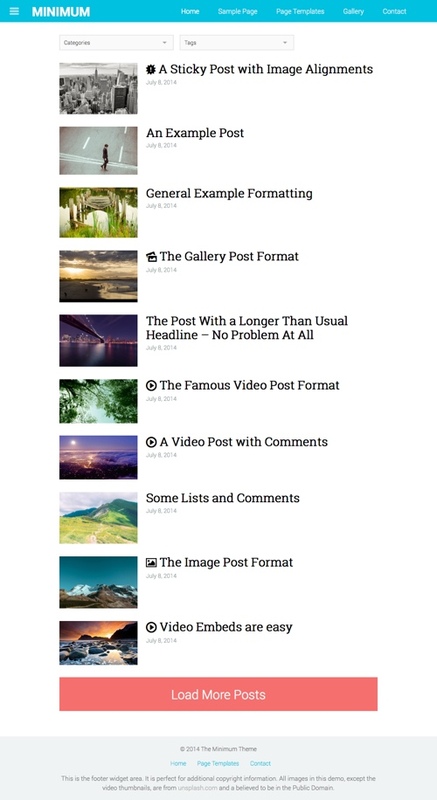 The theme support WordPress Post Formats so can easily post videos, pictures, quotes and normal blog posts and have them organized and styled properly. 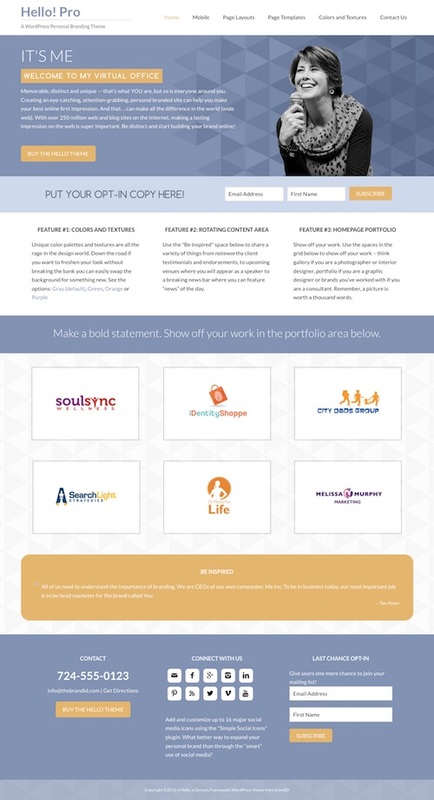 The portfolio section allows you to showcase your work or photos. You can upload multiple images to one portfolio item and categorise your work into sections. It has options for one, two or three column portfolio layouts. 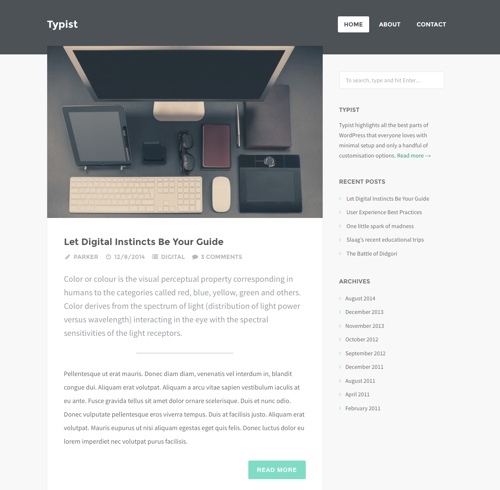 Typist is a premium WordPress theme for serious writers. It has a clean and minimalist design, easy setup and only a handful of customisation options. The theme is designed to engage your readers by providing them the best experience when reading your content while keeping you focus and continuously motivated to produce more great articles. It features a responsive and retina ready design, easy post formats, widgetized sidebar, clean semantic code, and is ready for translation. Editor is a beautiful free blog WordPress theme with amazing typography for bloggers and writers. It has a bold, clean and minimalist design that places the focus on your images and writing with large featured images and clear and legible typography. It has a mobile responsive design, a sticky sidebar, WordPress Customizer support, JetPack plugin support and more. 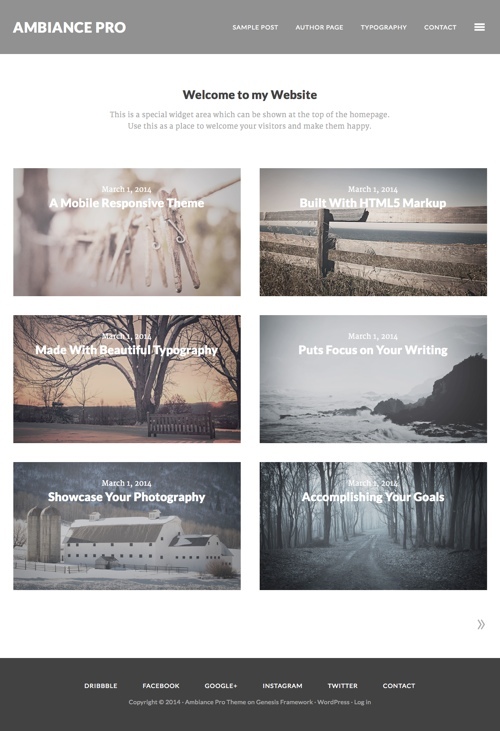 Radcliffe is a beautiful image heavy free WordPress theme for writers, bloggers and photographers that want their content to be center stage. The theme has a massive full screen featured images making it ideal for photo heavy blogs or photo blogs. It also has great typography, customisation options via the WordPress Customizer (logo, colour, widgets etc), translation ready code and retina ready and mobile responsive layout to ensure it works great on all mobile devices. 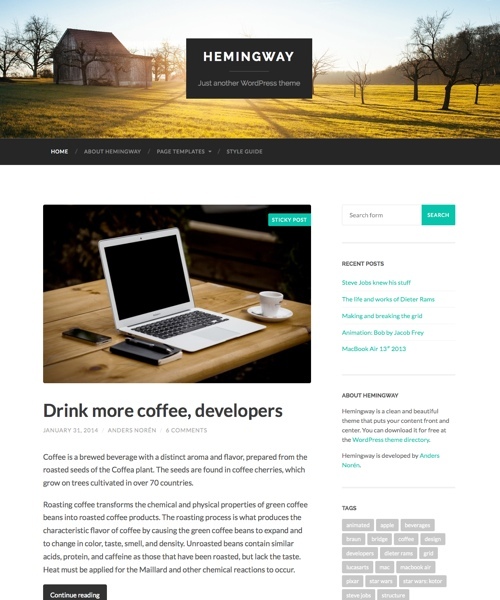 Hemingway is a free responsive blog WordPress theme with a really clean and beautiful design. The theme has a 2-column layout, custom featured header image with parallax scrolling effect and a fully responsive design. Some of the other features include: super sharp typography, 4 post formats (standard, featured image, video and aside), page templates, custom accent colours, mobile responsive and retina ready, custom logo upload, custom widgets, translation options and more. 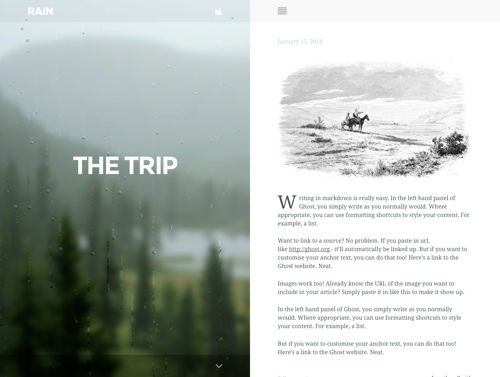 Rain is a creative and minimal WordPress theme for writers. It has a unique rain background that is 100% dynamic. All you have to do is upload your background photo and you have a nice rain animation background. The theme has a book like design and nice typography. It also has option for background audio.